Doncaster Knights winged their way to a first victory in six Championship games at the Athletic Ground. Curtis Wilson notched a hat trick and fellow wing Steve McColl also touched down as third-bottom Knights ran hot on a bitterly cold day to claim a bonus point 36-20 win over mid-table London Scottish. Both men touched down in the first half to secure Knights a 24-15 interval lead with Wilson bagging a brace in the final quarter to dash the Exiles’ comeback hopes after they had got back to within four points. Scottish grabbed an early lead when wing Miles Mantella intercepted a pass by fly-half Kurt Morath close to his own line and raced away to score an unconverted try. Knights hit back with the first of four first half tries on nine minutes when ace finisher Tom James beat the remnants of the Scottish cover on a 20m run to the line after backing up a break from just inside his own half by full-back Cameron Cowell and carried on by No 8 Josh Tyrell. Morath added the extras to make it 7-5. Scottish hit back and after going close earlier they opened up a 10-7 lead as Mantella capitalised on a favourable bounce to score a second unconverted try after McColl’s pass had hit skipper Michael Hills on the back. Knights regained the lead on 26 minutes when McColl intercepted a pass on halfway and had the legs to make it to the line for a try which Morath goaled to make it 14-10. No sooner had the cheers of the Doncaster contingent died down than full-back Joe Luca Smith scored in the corner to give the Exiles a 15-14 lead. The lead changed hands yet again on 34 minutes, second-rower Nick Civetta rewarding a spell of pressure on the Scottish line from a pick-and-go. Wilson, who had made a good run earlier in the half, secured Knights a try bonus point shortly before half time when latching onto a good pass by Morath, whose conversion attempt hit the post, and racing in from around 50m out for a superb try. The Exiles had come good in the second half of several recent games, and when Smith touched down out wide from a ball over the top of the Doncaster defence on 56 minutes, they fancied their chances. Morath, who had arguably his best game for the club, failed to give his side a bit more breathing space when firing wide with a 40m penalty on 65 minutes, but he made amends two minutes later when his clever crossfield kick set-up the chance for Wilson to dive over in the corner from close range. 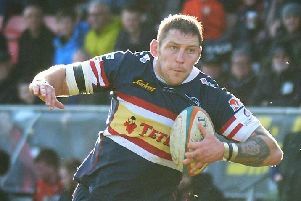 Despite Knights being down to 14 men at the time - Cowell having been sin-binned - Morath supplied a try-scoring pass to Wilson following a move from a ruck. Knights: Cowell, Wilson, Hayes, Creed, McColl, Morath, James; Hislop, Hunter, Quigley, Challinor, Civetta, Ryan, Hills, Tyrell. Rep: Malcolm, Sproston, List, Eames, Booth, Seniloli, Foley.